The Womensphere Festival celebrates and supports some of the finest women chefs and female restaurateurs in New York City. The world is invited to celebrate these extraordinary women - chefs, restaurateurs, entrepreneurs, and creators! We will be inviting men and women to join us for great conversations at themed brunches, lunches and dinners that we're organizing during the Womensphere Festival. Annisa, which means “women” in Arabic offers inventive Contemporary American first-class cuisine that reflects Anita Lo’s multicultural upbringing and classic French training. It is located in the heart of Greenwich Village. Anita Lo is one of the most respected chefs in the country, earning a two-star review from The New York Times. A first generation Chinese-American and an Ecole-Ritz Escoffier graduate, she has interned under Guy Savoy and Michael Rostang, and worked at Chanterelle and Mirezi. Amy’s Bread is a NYC bakery that features hand-made breads, morning pastries, decadent cookies, old-fashioned layer cakes, unique sandwiches, healthy salads, and more. Visit any of their three cozy bakery/cafés in NYC (Hell’s Kitchen, Chelsea Market and the West Village). Amy Scherber is the owner and founder of Amy’s Bread, launched in 1992. A graduate from the New York Restaurant School, worked as a cook at Bouley restaurant, trained in France in three bakeries before returning to New York to pursue bread baking. She baked bread and pastries at Mondrian restaurant before starting her own business. Maharlika means “Royalty” in Tagalog. 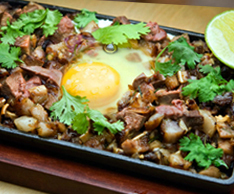 Located in the East Village, it proudly features the classic Filipino dishes with its cultural and indigenous flavor influences from Spain, Malaysia, China and America. Nicole Ponseca, co-owner of Maharlika and Jeepney went from advertising executive to NY restaurateur in 1998. She majored in business administration at USF. Paola's Restaurant is a welcoming home for Italian Cuisine and the classic dishes of Rome on Manhattan's Upper East Side. Having immigrated to America from Rome at age 16, Paola Bottero brought with her the traditions of the Italian kitchen and the embracing hospitality of the Italian home. Wafels and Dinges, located in the Lower East Side, is a gourmet food concept that has been credited with pioneering the food truck revolution in New York City. Wafels & Dinges is about giving people the best moment of their day while improving local communities with its iconic yellow food trucks, which are ranked Best Food Truck in NY by Zagat and have been consistently voted Best Food Truck in America. Rossanna Figuera is the co-founder of Wafels & Dinges. She is also the founder of The Talent Circle, a values-based career management firm specialized in executive search and coaching for professionals involved in Latin America financial services. A Columbia University-certified Executive Coach, Rossanna is also a Young Global Leader at the World Economic Forum. SALO, is a 50-week pop-up dinner tour in partnership with Feastly that aims to raise awareness of Filipino cuisine across the US. As an added bonus, the proceeds from the series are being donated to support the relief effort for Typhoon Haiyan, which devastated portions of the Philippines in November of last year. Yana Gilbuena, is a fast-rising Chef who thrives on traveling and cooking. Once a week throughout all the 50 states, she’ll be hunting down fresh ingredients, sending invites, and cooking up a storm in strangers’ kitchens, welcoming churches, on sunny rooftops, and any space that will have her. Yana is producing a Womensphere Salo on Friday, September 26. If you would like to receive an Invitation to the Womensphere Culinary Exploration event at any of these fine establishments, or if you would like to cover the initiative for the Press/Media, please fill out the form below.